After 5 hours and 20 minutes of running, 1 power bar, 5 shot bloks, 1 banana, untold amounts of water and gatorade, 37 degree weather, 20 mph winds, and spectators cheering us on for 26.2 miles, I finally crossed the finish line in Grant Park. Everyone from Plantation Motorola (Beatriz M artinez, Wafa A bdulRazzaq, Marcela T odd, Eric L im, Greg R aven, Bill S kidmore, Chuck L ail, Veronica G hoghos, Jocelyn N orris, Gold, Victoria, Allan, Daniel, and about 10 others) finished and got their medal. It was the best marathon ever. The Farland siblings, Spencer and Ali, cheered us on - they met us in four different places along the course. After about mile 22, I felt if I sawed my feet off and ran on nubs it would be more comfortable. No, I'm not being dramatic. Ok, maybe a little. Yes, it was rough at the end. Probably one of the hardest things I've ever done. We met up with Eric around mile 3 but he already couldn't feel his knee and we soon passed him. Around mile 7 we caught up with Marcela. She soon left us at mile 11 or so as we started falling behind. Beatriz's knee started hurting and she started walking more than running. Wafa and I couldn't keep walking so we left B at mile 14. I felt fine until about mile 18. Then I started to lose enthusiasm mentally since we had lost so much time earlier in the race and probably because I had been running for almost 4 hours. I felt better at mile 21 but still walked more than I should have. At about mile 23 I started to run more simply because I started getting cold. The temperature at 1pm was the same as it was at 8am. Nonetheless, I ran the last mile nonstop, finished without injury, and couldn't wait to get some warm clothes on, eat some real food, and stretch. It was tough but it was a lot of fun and I'm glad I did it! 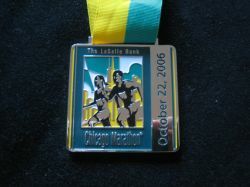 Check out live coverage of the 2006 LaSalle Bank Chicago Marathon here. I'm leaving to China today but I'll try to upload some pics while I'm away. I'll be back next weekend. Congratulations on completing your first Full Marathon! Still jet lagged from China? Thanks so much for everyone's support!